It seems slightly ridiculous to me now but I used to be afflicted with a phobia of the edible thistle that is the artichoke. It wasn’t the actual eating them that was the problem. In restaurants I’d happily wolf down delicious artichoke hearts in all their forms: antipasto, in salads, on pizza or mixed through pasta. No worries. But the thought of actually buying and taking home one of those pretty flower buds to prepare myself used to make me very nervous. So for years I was happy to dodge the artichoke preparation gig. I’d buy them in cans or bottles with all the difficult work done by some far off artichoke fairy. Too easy. But one sunny spring day I found myself at the Sydney Growers Markets and innocently sitting next to the asparagus was a pile of globe artichokes. Looking like temptation itself with their purple tips and bulbous body, something inside me changed and I found myself wanting to take one of those babys home. Of course after making it home with a lone artichoke among my bounty I promptly put it in the fridge with the other veg and tried to forget about it. Who was I kidding? There’s no way I’d be able to get through the complicated instructions and have something tasty in the end. My phobia had returned and the poor artichoke ended up a shrivelled version of it’s former self in fridge Siberia. A few artichoke free years later, I was flicking through a friend’s copy of Jamie Oliver’s Happy Days and there it was. The answer to my artichoke inadequacies: instructions on how to prepare artichokes with pictures. A ray of hope flashed on and I vowed that with Jamie’s help I would overcome my artichoke demons. And overcome it I did. I was a little perplexed at the incredibly smallÂ amount of edible food that my work yielded but it tasted divine and I was a happy girl. Free from my phobia shackles. Since then I have experimented with numerous ways of preparing and cooking artichokes and have found that as long as you have the freshest of artichokes in season, a lemon by your side to protect the freshly cut artichoke surface from browning and either oil or water with acid added to submerge your handiwork in as soon as it has been cut down to side. Then success is assured. My current favourite artichoke dish makes a hero of our veg after slow cooking it in herby olive oil ‘confit’ style. It is then stuffed with a tangy gremolata and topped with crunchy breadcrumbs for a delicious contrast of flavours and textures. 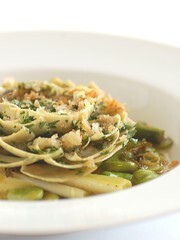 Served with a spring salad of broad beans and baby leeks, it makes a perfect vego main course. I’ve also been experimenting with baby artichokes which I am lucky enough to get from Fratelli Fresh. These cute little fellas are the lateral buds of the main artichoke and are perfect to serve raw in salads for a crunchy nutty addition….all good things. This was inspired by two sources: Sean Moran from his great book Let it simmer and Andy Harris from the October 06 issue of Australian Gourmet Traveller. Next time I make this I will double the amount of artichokes so I will have someÂ to keep in the oil for other uses. For my version of a photo guide click here, here, here & here.Â Good luck. To prepare artichokes peel off the dark outer leaves until you reach the pale yellow ones. Trim 2cm from the top of the bud, I found a bread knife works a treat. Rub the cut surfaces of the artichokes with a cut lemon. Trim off the stem so that the bottom of the flower sits flat and submerge in the oil mixture immediately. 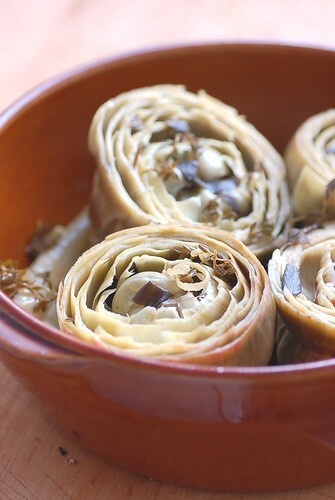 If the oil is not deep enough to cover the artichokes turn them frequently so they are protected from the air. Peel the stem until you have the white centre core which looks something like a white asparagus and trim the bottom. Submerge this quickly in the oil. Repeat with the remaining artichokes. Simmer over low heat 25mins or until stems are tender, remove stems, then simmer for another 20-25mins or until the hearts are also tender. Remove from the oil and allow to cool. Reserve cooking oil. When cool enough to handle, part the centre leaves of the flower and remove the hairy choke with a teaspoon. For the salad, blanch the beans and leeks for 2 mins in salted water and drain and refresh in a bowl of cold water. Double peel the broad beans discarding pods. Cut leeks in half lengthwise. Heat 1/4C cooking oil from the artichokes over a medium heat in medium frypan and saute for 5-10 mins or until tender. Season to taste. For the gremolata, chop the garlic, parsley and zest of the other lemon together until fine. heat another two tablespoons cooking oil in a frypan and fry breadcrumbs over medium heat until golden and crispy. Drain on paper towel. To assemble the dish, divide gremolata between the artichokes and stuff between the leaves opening it out so it looks more like a pretty flower. Divide leek and beans between four plates. 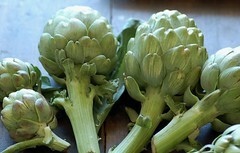 Top with artichoke flowers and stems and serve sprinkled with breadcrumbs. 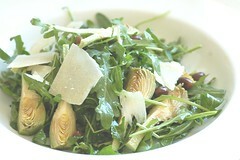 Stephanie Alexander first alerted me to the possibility of serving tiny artichokes raw and sliced in a salad. If you have access to tiny artichokes I really recommend that you give them a go. parmesan cheese shavings and crusty bread to serve. Make vinaigrette by combining vinegar, oil anchovies and thyme. Season to taste. Working quickly, prepare the artichokes by removing the dark outer leaves. Trip top 1cm from flower and rub cut surface with lemon. Divide into quarters rubbing with lemon as you go and toss immediately in the vinaigrette. Repeat with remaining artichokes. When ready to serve toss though rocket leaves and divide salad between four plates. Scatter with olives and parmesan shavings and serve immediately with crusty bread and a crisp glass of riesling. I am yet to conquer my fear :) Yours look fantastic, and I love that top photo too. Fantastic dof. I like artichokes as long as someone else prepares them, I don’t like preparing them. what gorgeous pictures! I sort of have the opposite affliction – I only want to have them steamed then dip them in butter! I have a hard time using them in anything else, but your lovely pictures are inspiration. What an absolutely gorgeous site – I love it and can’t wait to start trying some of your recipes. I got here via Jane Perrone at Horticultural and I love it! The pictures are so good. I’ve just had my lunhc but still my mouth is watering. I can see I’m going tobecome a regular visitor. Thank you. I’m another who has always been afraid to tackle fresh artichokes. I just ran across this Blog. This is WONderful !! I recenly made my first foray into cooking artichokes, after picking some up at the Castle Hill growers’ market. They were much easier to prepare then I thought they’d be – the only thing was we didn’t take off quite enough of the outside leaves, so a couple of them were a bit chewy. This is a lovely collection of recipes, I especially like the look of the broad bean salad. Thanks.. I feel exactly the same way as you did about artichokes though I am embarassed to say I still havent tried preparing them myself – it’s on my to do soon list & will try not to put it off for too much longer!